Valentine's Day Ideas | Scrolls Unlimited, Inc.
Valentine's Day is a great time to make an impression with the one you LOVE! 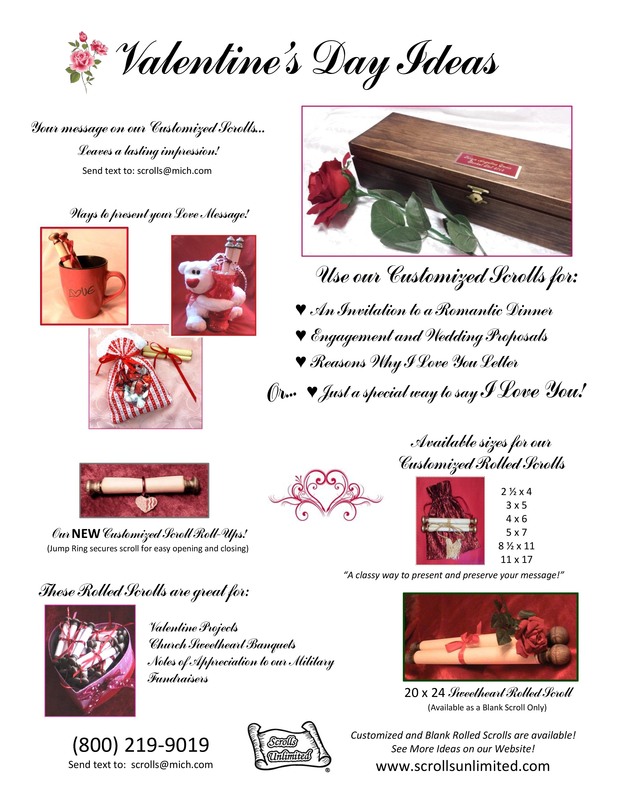 Use our Rolled Scrolls for an ~ Invitation to a Romantic Dinner ~ For an Engagement or Wedding Proposal ~ or just make a list with 100 Reasons Why I Love You! Popular parchment colors for our SWEETHEART scrolls is natural cream, white and gold. Looking for more options as far as colors - go to Customized Rolled Scrolls! If you have any questions - please feel free to call us at (800) 219-9019 or email us at scrolls@mich.com. This is classy - unique - and a perfect way to send your special message on Valentine's Day! &nb.. This white cuddly LOVE Bear comes with a red vase for a perfect way to deliver your SWEET 8 1/2 x 11..
Our heart shape bottles are a great way to send a small message to your loved one. A great way.. These reusable candy bags are handcrafted and lined with plastic so it can be filled with your favor..
A little scroll that is perfect for inviting your loved one to a special dinner or event. Comes with.. This 11 x 17 Rolled Scroll is the largest scroll we can print on. Comes printed with your mess..
Great addition to complete your 11 x 17 Rolled Scroll! ..
Comes with a fancy ribbon with hearts! .. This blank scroll gives you the opportunity to write your own scroll. Tube comes with this scr..